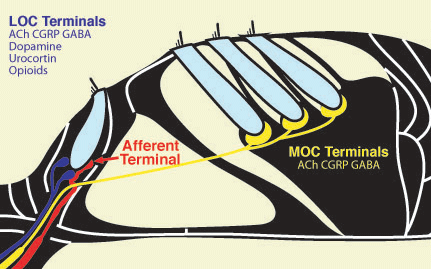 The sensory epithelium of the inner ear (organ of Corti) contains one row of inner hair cells (IHCs), three rows of outer hair cells (OHCs), a single auditory nerve afferent contacting an IHC, a representative efferent fiber from the medial olivocochlear (MOC) system, contacting all three rows of OHCs, and an efferent fiber from the lateral olivocochlear (LOC) system contacting the peripheral terminal of an auditory nerve fiber. In the schematic, arrows indicate direction of information propagation along the neurons. Cross-section schematic of the sensory epithelium of the inner ear (organ of Corti).